Infective Endocarditis (IE) is a disease of the cardiac endothelial surface caused by an array of microbial pathogens. Right-sided IE has been known to be common among intravenous drug user population, but involvement of right and left sided valves is infrequent. 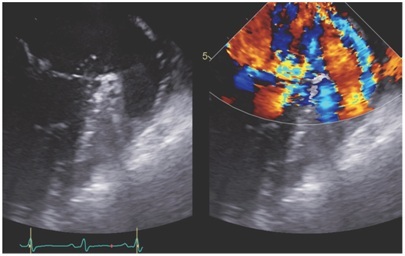 Herein we present the case of a 26 year old female intravenous drug user who was found to have infective endocarditis with vegetation’s on both the tricuspid and the mitral valve with flail mitral valve identified on transesophageal echocardiogram. Her clinical course was further complicated by presence of septic embolization to the brain, as well as leptomeningeal disease, which has been infrequently reported in this population. The complex nature of her presentation posed a treatment challenge of first proceeding with medical anti biotic treatment versus early surgical management. Infective Endocarditis (IE) is a disease of the cardiac endothelial surface caused by an array of microbial pathogens . Despite advancement in diagnosis and treatment modalities, its morbidity and mortality remains high and it often leaves grave consequences . Between 2000 and 2011, the incidence of Infective Endocarditis (IE) in the United States increased from 11 per 100,000 populations to 15 per 100,000 populations. Approximately 10,000 to 15,000 new cases of IE are diagnosed in the United States each year . The incidence of infective endocarditis is higher in the Intravenous Drug User (IVDU) population compared to Non-Intravenous Drug User group (NIVDU). Both right and left heart chamber involvement are extremely rare . Complications of IE include cardiac, neurological, renal and musculoskeletal complications, as well as complications related to systemic infections (including embolization, metastatic infection and mycotic aneurysm). More than one complication can occur simultaneously . In this case report, we present tricuspid and mitral valve involvement of the heart in a young female intravenous drug abuser complicated by systemic embolization and leptomeningeal disease. A 26-year-old female with a history of poly-substance abuse including: Cocaine, Heroin and Opioids presented to hospital with subjective feeling of fever and back pain. On examination the patient had low grade temperature (Temperature of 100.2°F, heart rate 96/m, blood pressure 101/62 and saturating 99% on room air). Skin examination revealed Jane way’s lesions over the palms and foots, splinter hemorrhages and presence of multiple intravenous marks in upper extremities. Head, Ear, Nose and Throat examination revealed subconjunctival hemorrhages with poor dental/oral hygiene. Her neck examination was supple without anterior or posterior cervical lymphadenopathy. Heart examination revealed regular heart sounds with 4/6 grade holosystolic murmur of mitral regurgitation heard throughout the precordium radiating to the back (Table1). Laboratory data revealed that two blood cultures drawn from 2 sites were positive for gram positive coccion clusters identified as Staphylococcus aureus. Transthoracic echocardiograph reveals small echogenic; mobile vegetation on the atrial aspect of the anterior leaf of the mitral valve and a transesophageal echocardiogram was indicated for further evaluation. Transesophageal Echocardiogram (TEE) revealed an ejection fraction of 60% to 65%, diffusely thickened mitral valve with a focal area of flail/aneurysm involving the posterior leaf let of the mitral valve (Figure 1) with turbulent color raising the suspicion for perforation and severe mitral regurgitation. Vegetation’s were also seen on the tricuspid valve (Figure 2). On day 3-post hospitalization, the patient continued to complain of headaches. Brain MRI revealed multiple small oval lesions, with restricted diffusion in both cerebellar hemispheres, indicative of showers of septic emboli and abnormally increased T2 signal intensity on the flair sequence in the cortical and cerebella sulci (Figure 3). The T1 AX POST and TI COR images revealed leptomeningeal disease (Figure 4). The patient was diagnosed with infective endocarditis with septic embolization to the brain and leptomeningeal disease. The patient was initially started on Intravenous Cefazolin 2g every 8 hourly and Vancomycin at 15mg/kg/dose every 12 hourly. As culture and sensitivity became available, patient was switched to Oxacillin 2g every 4 hourly for better central nervous system penetration. Antibiotics were scheduled for 6 weeks of IV antibiotics via a peripherally inserted central catheter. Our patient received a six weeks course of antibiotics and recovered without recurrent emboli. She was also enrolled into the hospitals inpatient drug rehabilitation and detoxification program as patient will be in the inpatient setting for at least 6 weeks for antibiotic therapy. The goal is to have patient fully detoxified and rehabilitated by the end of antibiotics therapy in order to be eligible for valve replacement. At discharge she was referred to the cardio-thoracic surgeons for evaluation of her tricuspid and mitral valves, she was followed up in their clinic for additional 4 weeks to ensure her compliance before her surgery was fixed. Intra-operatively mitral valve rupture was noted with vegetation’s on the tricuspid valve, she received a mitral valve replacement with a mechanical valve and a tricuspid valve repair and she was then started on warfarin for anticoagulation. Infective endocarditis in intravenous drug users often occurs with right-sided involvement and infrequently with right and left sided valvular involvement . This case is unique because of its presentation of right and left sided valve involvement, that was further complicated with septic embolization and leptomeningeal disease. The outcomes and benefits of early surgical intervention versus late surgical intervention in patients with right and left sided valve involvement are yet to be reported, and this offers itself as a topic for future studies. The conundrum of antibiotic therapy (medical treatment) versus early surgical therapy in infective endocarditis remains enigmatic and thus requires careful clinical surveillance and close adherence to American College of Cardiology Guidelines for timing of surgery in native valve endocarditis . Our patient had a penetrating lesions on the TEE, meeting American College of Cardiology guidelines class 1 indication for early surgical therapy, however she was not found to be in heart failure and was hemodynamically stable, a decision for medical therapy with antibiotics was made given the constellation of septic embolization and leptomeningeal disease and also give time for patient to benefit from the hospital’s rehabilitation from drug of abuse as we feared releasing the patient early could jeopardize her clinical progress. Decision on choice of initial therapy in native endocarditis should be considered on a case by case basis . It is of paramount importance that a patient is totally rehabilitated from use of drugs of abuse prior to surgical interventions as the consequences of developing a recurrent endocarditis on a mechanical or bio prosthetic valve are grave. Never truly understood that my actions could cause me so much health scare, will one to use this medium to encourage every intravenous drug user to quit because of possible health complications. Hope my case can go a long one in helping even if just an individual. Oylumlu M, Ercan S, Basanalan F, Davutoglu V (2013) Both-sided native valve endocarditis in an intravenous drug misuser. BMJ Case Rep.
Ji Y, Kujtan L, Kershner D (2012) Acute endocarditis in intravenous drug users: A case report and literature review. J Community Hosp Intern Med Perspect 2: 11513. Moss R, Munt B (2003) Injection drug use and right sided endocarditis. Heart 89: 577-58. Berdusco ET, Steiner IP (2004) Acute Bacterial Endocarditis in intravenous drug users: Case presentation and Review. Israeli Journal of Emergency Medicine 4: 20-24. Mylonakis E, Calderwood SB. Infective endocarditis in adults. New Engl J Med 345: 1318-1330. JohriA M, Kovacs KA Kafta H (2009) An unsusal case of infective endocarditis: Extension of tricuspid valve vegetation into the left atrium through a patent foramen ovale. Can J Cardion 25: 429-431. Paterick TE, Paterick TJ, Nishimura RA, Steckelberg JM (2007) Complexity and subtlety of infective endocarditis. Mayo Clin Proc 82: 615-62. 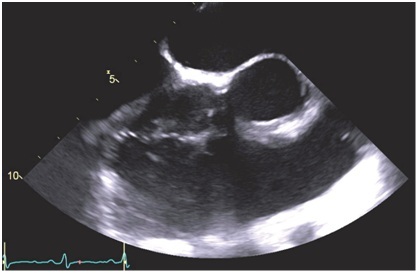 Figure 1: (A) Transesophageal echocardiograph shows mitral leaflet perforation. (B) Transesophageal echocardiography with color flow demonstrating regurgitation through the mitral perforation. Figure 2: Transesophageal echocardiograph shows tricuspid valve echo densities suggestive of vegetation. Figure 3: Brain MRI shows multiple small oval lesions with restricted, abnormally increased T2 signal intensity on the FLAIR sequence in the cortical and cerebella sulci revealing septic embolization on AX T2 Flair. 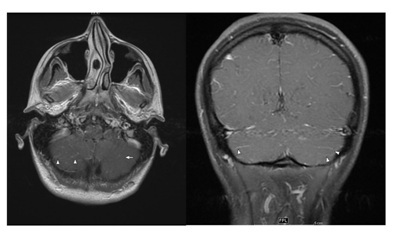 Figure 4: Brain MRI with contrast shows TI AX POST and T1 COR MRI images with subtle leptomeningeal enhancement in the cerebral sulci indicative of meningitis in a patient with known cerebral emboli from endocarditis. Table 1: Detailing Dukes criteria met by the patient- 3 major criteria and 3 minor criteria. Citation: Mbaebie N, Shaw P (2018) Right and Left Sided Endocarditis with Systemic Embolization and Leptomeningeal Disease in a Young Intravenous Drug User. J Clin Stud Med Case Rep 5: 058. Copyright: © 2018 Mbaebie N and Vikas V. This is an open-access article distributed under the terms of the Creative Commons Attribution License, which permits unrestricted use, distribution, and reproduction in any medium, provided the original author and source are credited.